The USS Indianapolis was the last major American ship sunk by enemy forces during WW II, with the largest loss of life of at sea in our nation's history, as some 300 men went down with the ship and over the next four days another 500 or so died of starvation, exposure, suicide and shark attacks. Let's make a movie! Robert Downey Jr., along with his wife Susan, will produce a film that looks at the tragedy through the eyes of Hunter Scott, a Florida schoolboy whose project in the 1990s about the incident eventually found its way to Congress, and ultimately led to the exoneration of Capt. Charles Buster McVay III, who'd been court-martialed for "hazarding his ship by failing to zigzag." Scott had been inspired to research the Indianapolis after watching "Jaws," and hearing Robert Show's character remembering the incident. He would eventually interview more than 100 survivors. Robert Downey Jr. and Jude Law return as the great detective and his trusty sidekick, Watson, this time matching wits with their archenemy, Dr. Moriarty. Opens Dec. 16. The Downeys have Robert Schenkkam, who received an Emmy nomination for his work on "The Pacific," working on the script. 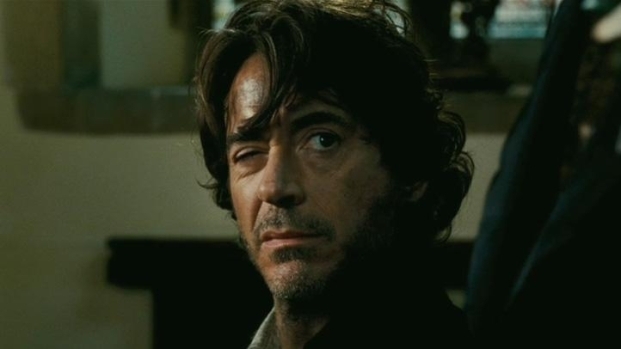 In the meantime, Downey can be seen Dec. 16 in "Sherlock Holmes: A Game of Shadows", and May 4 in "The Avengers."